UPDATE: It looks it'll be "Mr. Chilly" after all. The change over to "Oswald" was only temporary on the PTR. 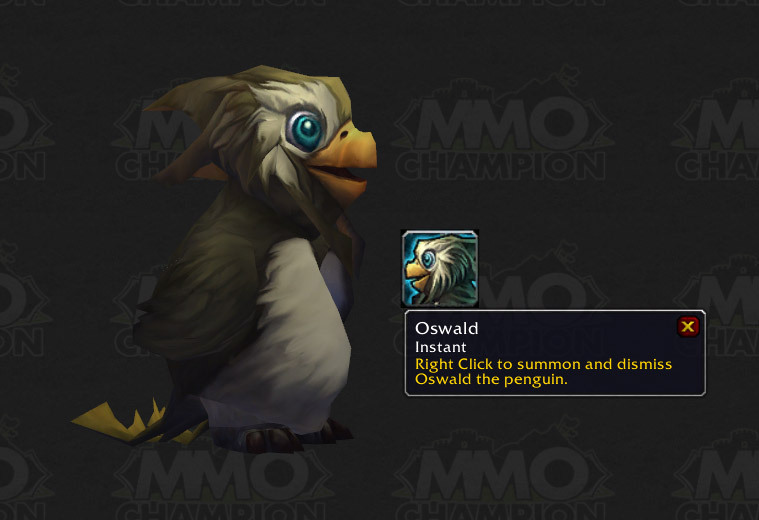 It looks like we will finally be getting a pet penguin as a reward for merging our WoW account with Battle.net. Some of you may remember Mr. Chilly from the WotLK beta. Well several months and a name change later, he will be making his in-game debut! According to MMO Champion players will have until November 12 to merge their WoW account to a Battle.net account without affecting gameplay. After this time players without merged accounts will be unable to log in until they make the merge. Once you’ve successfully merged a World of Warcraft account with a Battle.net account, the penguin pet will be sent via in-game mail to all existing characters on the merged World of Warcraft account, along with all future characters on that World of Warcraft account. Players who merged previously will also receive the pet this way. The new penguin pet has not gone live yet, but we expect him to be in-game soon. The ability to get him will be removed at some point, though no date has been set yet. Also, WoW accounts created after November 11th will be ineligible to receive the pet. So don't delay, merge your account today!